If you're looking to protect the cargo in your truck bed by adding a lock to your tailgate, you've come to the right place. Pop & Lock Tailgate Lock Kits come with everything you'll need to add a dependable lock to your tailgate, protecting both the tailgate itself and the cargo within the truck bed from theft. Pop & Lock Tailgate Locks install in minutes without any drilling required. They install in minutes, mounting in the recess underneath the existing handle for an OEM look. 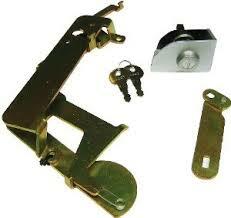 Your pop and lock kit will include two keys and easy to follow installation instructions. The part number for this item is PL6102 and it fits 2005-2014 Honda Ridgeline models.